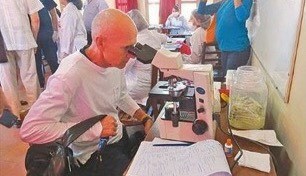 Cesar Compadre, left, and Dean Keith Olsen examine and discuss a medicinal plant growing in the Bolivian countryside. Aug. 7, 2018 | Aug. 2, 2018 | Before a meaningful exchange can take place between people, connections must be made, and earlier this summer, the UAMS College of Pharmacy made them in Bolivia. 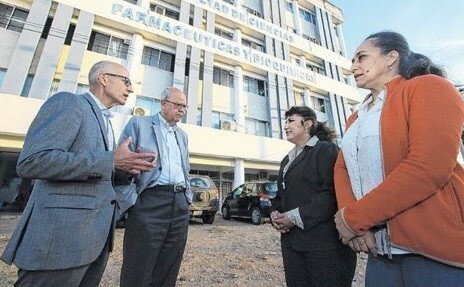 Both the college’s Dean Keith Olsen, Pharm.D., and Cesar Compadre, Ph.D., professor in the college’s Department of Pharmaceutical Sciences, traveled to Santa Cruz, Bolivia, and stayed for 10 days there to meet with faculty, students and staff in the College of Pharmacy at the Universidad Autonoma Gabriel Rene Moreno, a large university with about 100,000 students. Olsen and Compadre weren’t the first to make the journey between Bolivia and Little Rock. Compadre said that about three years ago, a pharmacy professor from the university in Santa Cruz visited him and other faculty at the college and has been urging them to make a reciprocal visit. Inspired by President John Kennedy, what became the Partners of the Americas program was established in the U.S. Agency for International Development. It matched U.S. states with countries and regions in Central and South America. For more than 40 years, Arkansas has been linked to East Bolivia and more than 100 Bolivian students are pursuing degrees at the University of Arkansas – Fayetteville, Compadre said. meetings with faculty and staff and representatives from the Partners of the Americas-Bolivia organization. Compadre said hospitality is a strong tradition in Bolivia, and they were taken out to dinner almost every night, dinners that included an abundance of friendly conversation and great generosity from the hosts. Olsen and Compadre also made visits to the countryside, and there Compadre made an examination of some of the medicinal plants used in Bolivia. During a recent trip to Santa Cruz, Bolivia, Dean Olsen, left. and Cesar Compadre confer with Blanca Blanca Elena Saldana and Nidia Soria Medina, respectively the dean and subdean of the Farmacia de la Universidad Autonoma Gabriel Rene Moreno. 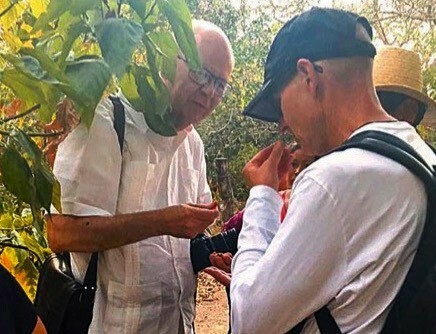 If the right bilingual member of the faculty can be identified to visit Bolivia, then a faculty exchange might occur as soon as the next spring semester, Olsen said. A student exchange will take more time to arrange, but both Olsen and Compadre hope it will take place within a few months after the faculty exchange.